Natives of Chile’s Atacama Desert and the surrounding scrublands, rose hair tarantulas are adapted to a hot, dry climate. During the day they remain in burrows, where temperatures are cooler and humidity higher than on the surface. At night they emerge to hunt, usually ambushing their prey. While they’re hardy enough to weather an extreme climate, as pets they can suffer from too much or too little moisture. Rose hair tarantulas live in the desert and other arid environments in Chile, Argentina and Bolivia. Although the climate tends to be very dry, periodic fogs from the Pacific Ocean bring moisture and cool the air, and nightly dew helps keep humidity levels around 80 percent in the tarantulas’ burrows. These tarantulas base their eating and molting habits on the Southern Hemisphere’s seasons, which are opposite those of the United States. In the wild they eat as much food as they can whenever they can, storing up nutrients for lean times and droughts that can last a year or more. Choose an appropriately sized enclosure for your rose hair tarantula. A good guideline is to provide space at least three times as long as your pet’s leg span, which for adults usually is around 5 inches. Many keepers use 5-gallon tanks for their rose hairs. For substrate, you can choose from a variety of materials—including sand, orchid bark, peat moss and coconut bedding—but don’t mix them. Substrate should be at least an inch deep, although if you want your tarantula to burrow, provide 3 or more inches of depth. The enclosure should include several hiding places, such as logs or coconut shells, and a shallow water dish that’s smaller around than your spider. 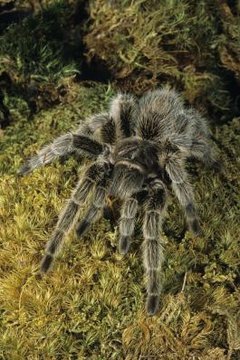 A tarantula might roam around the tank or hang from the wall as a reaction to either too much or too little humidity. If the tank is too moist, replace the substrate or try a different type. Check the habitat periodically with a hygrometer to make sure it isn’t too dry, and monitor any heat source that might leach moisture from the air. If your tarantula hangs out in the water dish, you probably need to mist lightly. Avoid getting the substrate wet; it should retain just enough moisture that the burrow walls don’t collapse. If the problem persists, talk to your vet about how to maintain a comfortable climate for your rose hair. Never rely on direct sunlight to warm your pet or help him adapt seasonally—he’ll overheat, often fatally. To help him stay healthy and adjust to seasons in the US, move him to a warm area—around 75 degrees Fahrenheit—during the summer. In the winter, place him in a cooler area, in the high sixties, where he can experience shorter periods of natural light without disruptions caused by artificial indoor lights.